Lifting Chains & Rigging Accessories | Holloway Houston, Inc.
Is a general purpose chain of standard commercial quality. Made from low carbon steel, this chain is frequently used for fabricating tow chains, logging chains and, when appropriate, tie down or binding chains. The manufacturer’s symbol and grade marking of 3, 30, or 300 is placed on the chain links every foot or so. Grade 30 Proof Coil Chain is not to be used for overhead lifting. Is a higher strength chain used for years in the trucking industry for tie downs that meet DOT specifications. Made from a higher carbon steel, its strength surpasses proof coil working load limits, size for size, by a factor of 2 to 1. The manufacturer’s symbol and grade marking of 4, 40, 43, or 400 is placed on the chain links every foot or so. Grade 40 High Test Chain is not to be used for overhead lifting. Is used primarily to tie down loads on over-the-road equipment. Made from heat-treated carbon steel it has about 25% more strength than high test chains. The manufacturer’s symbol and grade marking: 7, 70, or 700 is placed on the chain links every foot or so. Grade 70 High Test Chain is not to be used for overhead lifting. Is designed to stretch a minimum of 15% before it breaks, alloy chain is the only grade of chain approved by OSHA and other agencies for overhead lifting. Its alloy, heat-treated steel makes it ideal for making lifting slings and heavy duty tow chains. The manufacturer’s symbol and grade marking: 8, 80, or 800 is placed on the chain links every foot or so. Grade 80 Alloy Chain is suitable for overhead lifting. The most recent alloy chain, provides about 25% higher working load limits than Grade 80 alloy chain with some limitations reported in lower ambient temperatures and availability of fittings. The manufacturer’s symbol and grade marking: 10 or 100 is placed on the chain links every foot or so. Grade 100 Alloy Chain is suitable for overhead lifting. Determine the overall reach from bearing point of master link to bearing point on hook. Select components, assemble chain and components. Affix sling identification tag to sling. The tag is a vailable from your Authorized Crosby Distributor. Each sling shall be marked to show: name or trademark of manufacturer, grade, nominal chain size, number of legs, rated load for the type(s) of hitch(es) used and angle upon which it is based (reach). If measurement comes in the link, cut the following link. For two leg type slings, count the links and use an even number for clevis hooks and an odd number for eye hooks. This will position hooks in the same plane. In multileg slings always use the same number of links in each leg. In shortening applications, a 20% reduction of the Working Load Limit is required except when using the Crosby A-1338 cradle grab hooks or S-1311N chain shortener link. They can be used without any reduction to the Working Load Limit. 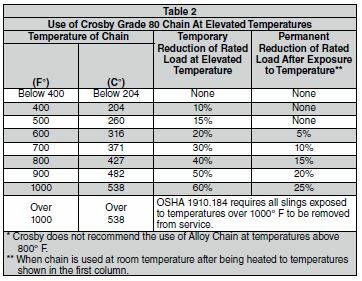 These warnings and instructions are applicable to alloy chain slings produced from Crosby Grade 8 (80) and Grade 10 (100) chain and components. Only alloy chain, grade 80 (Crosby Spectrum 8®), or grade 100 (Crosby Spectrum 10®), should be used for overhead lifting applications. Working Load Limit (WLL) is the maximum load in pounds which should ever be applied to chain, when the chain is new or in “as new” condition, and when the load is uniformly applied in direct tension to a straight length of chain. Working Load Limit (WLL) is the maximum working load for a specific minimum sling angle, measured from the horizontal plane. The minimum sling angle and Working Load Limit is identified on the sling. The Working Load Limit or Design factor may be affected by wear, misuse, overloading, corrosion, deformation, intentional alterations, sharp corner cutting action diameter of curvature over which the sling is used (D/d) and other use conditions. Shock loading and extraordinary conditions must be taken into account when selecting alloy chain slings. See OSHA Regulation for Slings 1910.184, ASME B30.9-“SLINGS”, ASME B30.10-“HOOKS”, and ASME B30.26 “RIGGING HARDWARE” for additional information. ASME B30.9 requires a designated person inspect each new sling and attachments prior to initial use, as well as the user or other designated person perform a visual inspection on a sling each day it is used. In addition, a periodic inspection shall be performed by a designated person at least annually, and shall maintain a record of the last inspection. For further inspection information, see Chain Inspection section of this document, or refer to ASME B30.9-1.9. Wear, nicks, cracks, breaks, gouges, stretch, bend, weld splatter, discoloration from excessive temperature, and throat openings of hooks. Chain links and attachments that do not hinge freely to adjacent links. Latches on hooks, if present, that do not hinge freely, seat properly or show evidence of permanent distortion. Makeshift fasteners, hooks, or links formed from bolts, rods, etc. Mechanical coupling links in the body of the chain. Other damage that would cause a doubt as to the strength of the chain. The weight of the load must be known, calculated, estimated or measured. The loading on the slings will depend on where the center of gravity is located. Select sling having suitable characteristics for the type of load, hitch and environment. Slings shall not be loaded in excess of the rated capacity. Consideration shall be given to the sling load angle which affects rated capacity. (See load chart Table 4 for Grade 100 (SPECTRUM 10®) and Table 5 for Grade 80 (SPECTRUM 8®). Never rig a sling with an angle less than 30 degrees to horizontal. Slings in a basket hitch should have the load balanced to prevent slippage. The sling shall be hitched in a manner providing control of the load. Always make sure the hook supports the load. The latch must never support the load. Read and understand Crosby hook and hook latch Warnings and Application Instructions. For two legged slings with angles greater than 90 degrees, use an intermediate link such as a master link or bolt type shackle to collect the legs of the slings. The intermediate link can be placed over the hook to provide an in-line load on the hook. This approach must also be used when using slings with three or more legs. When using chain slings in choker applications, the Working Load Limit must be reduced by 20%. Crosby recommends a minimum angle of choke of 120 degrees (see Figure 1). Consult the manufacturer when planning to use an angle of choke less than 120 degrees. If Crosby A-1338 Cradle Grab hooks are used at the minimum angle of choke of 120 degrees, the full sling rated WLL can be utilized. When using chain slings in basket applications where the D/d (see figure 2) is less than 6, the rated load must be reduced by the values given in Table 1. This reduction does not eliminate the need to protect chain slings against damage caused by contact with edges, corners, or protrusions. Do no use a chain sling with a D/d that is less than two. In shortening applications, a 20% reduction of the Working Load Limit is required except when using the Crosby A-1338 Cradle Grab Hooks, S-1311 Chain Shortener Link, the A-1355 Chain Choker Hook in-conjunction with the S-1325 Chain Coupler Link, or the Crosby ELIMINATOR® shortener link. They can be used without any reduction to the Working Load Limit. Slings should always be protected from being damaged by sharp corners. Slings should not be dragged on the floor or over abrasive surface. Chain sling links should not be twisted or kinked. Slings should not be pulled from under loads if the load is nesting on the sling. Slings that appear to be damaged should not be used. unless inspected and accepted by designated person. Personnel, including portions of the human body, should be kept from between the sling and the load, and from between the sling and the crane hook or hoist hook. Personnel shall stand clear of the suspended load. Personnel shall not ride the sling. Shock loading should be avoided. Twisting or kinking the legs (branches) should be avoided. During lifting, with or without the load, personnel should be alert for possible snagging. When using a basket hitch, the legs of the sling should contain or support the load from the sides, above the center of gravity, so that the load remains under control. Sling shall be long enough so that the rated capacity of the sling is adequate when the angle of the legs (branches) is taken into consideration. (See Table 4 for Grade 100 Chain and Table 5 for Grade 80 Chain). It must be recognized that certain factors in the usage of chain and attachments can be abusive and lessen the load that the chain or attachments can withstand. Some examples are twisting of the chain; disfigurement; deterioration by straining, usage, weathering and corrosion; rapid application of load or jerking; applying excessive loads; sharp corner cutting, D/d, action and non-symmetrical loading effects. Excessive high or low temperatures or exposure to chemically active environments such as acid or corrosive liquids or fumes can reduce the performance of the chain and components. Extreme temperature will reduce the performance of alloy steel chain slings. Normal operating temperature is –40°F to 400°F (-40°C to 204°C). 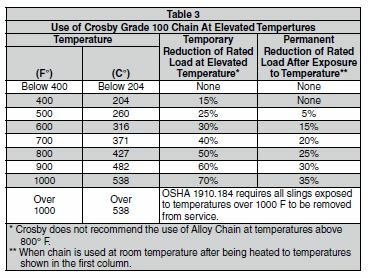 Reference temperature exposure chart to determine reduction of WLL due to operating at, and after exposure to, elevated temperatures (see Table 1 for Grade 80 Chain and Table 2 for Grade 100 chain). Chemically active environments can have detrimental affects on the performance of chain. The effects can be both visible loss of material and undetectable material degradation causing significant loss of strength. Chain should not be subjected to galvanizing, or any plating process. If it is suspected the chain has been exposed to chemically active environment, remove from service. A visual inspection for damage shall be performed by the user or designated person each day the sling is used. Conditions such as those listed in ASME B30.9-1.9.4 Removal Criteria, or any other condition that may result in a hazard, shall cause the sling to be removed from service. Slings shall not be returned to service until approved by a qualified person. Written records are not required for frequent inspections. complete inspection for damage of sling shall be periodically performed by a designated person. Each link and component shall be examined individually, taking care to expose and examine all surfaces including the inner link surface. The sling shall be examined for conditions such as those listed in ASME B30.9-1.9.4 Removal Criteria, and a determination made as to whether they constitute a hazard. Written records of the most recent periodic inspection shall be maintained, and shall include the condition of the sling. Excessive wear, nicks, or gouges. 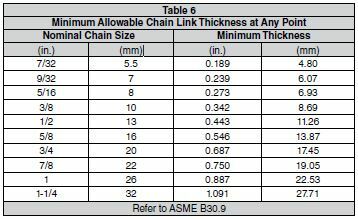 Minimum thickness on chain link shall not be below the values listed in Table 6. Slings shall be repaired only by the sling manufacturer or a qualified person. A repaired sling shall be marked to identify the repairing agency per ASME B30.9 Section 9-1.7. Chain and components used for sling repair shall comply with the provisions of ASME B30.9. Repair of hooks shall comply with ASME B30.10. Cracked, broken or bent chain links or components other than hooks shall not be repaired; they shall be replaced. Mechanical coupling links shall not be used within the body of an alloy chain sling to connect two pieces of chain. Modifications or alterations to the sling or components shall be considered as repairs and shall conform to all other provisions of ASME B30.9. All repairs shall comply with the proof test requirements of ASME B30.9 Section 9-1.6.